In the age of Amazon Inc. (AMZN - Get Report) , which retailers can survive? The ones who offer luxury, convenience and the sort of in-person store experience you're lacking from your Amazon cart. Macy's (M - Get Report) owned Bluemercury Co-founder and COO Barry Beck has figured that much out, thriving in a beauty space through a nimble approach to placing neighborhood stores where his customers live. In fact, their average customer lives five or six blocks from their local store. Bluemercury was founded in 1999 when co-founder Marla Beck was growing tired of only being able to purchase cosmetics at drug or department stores. Serial entrepreneur Barry Beck saw an opening, and together they created the luxury beauty retail chain, e-commerce provider and cosmetics brand developer with 150 operating stores today. Twenty of those stores are inside Macy's stores. Bluemercury was acquired by Macy's in March 2015 for $210 million, and in a phone interview with TheStreet Beck admitted that the "irony of selling to a department store isn't lost on them." He noted that Macy's has been a great partner and they ultimately chose to sell to them because of their West Coast Innovation Lab (Bluemercury has their own in-house brand) and thanks to Macy's omni-channel ability, could accelerate growth much more quickly than on their own. But what about our current reality, where mall traffic is stagnating if not in danger of being entirely snuffed out? When asked, Beck was steadfast in his belief the death of the mall is greatly exaggerated. "The reality is brands need a real world presence," he said. Brands need a storefront not only to foster loyalty, but offer tangible instant gratification, one of the few things Amazon lacks. He also mentioned that malls will adapt, and become more of an entertainment center rather than a labyrinth or purely storefronts. Coye Nokes, partner and retail specialist at OC&C Strategy Consultants noted in an email to TheStreet, "As an industry, beauty has been more resilient to the challenges of physical retail primarily due to the experiential nature of the product driven by the importance of trial and ability to add services to the offer (spa services, etc); Ulta (ULTA - Get Report) is an example of a retailer that has held up very well to the challenges in retail." Another reason why beauty has been resilient in retail is the pure, fleeting joy of instant gratification. Makeup purchases are certainly on the lower end of retail therapy, even when one is buying from a luxury brand. Or giving oneself an experience such as a spa treatment at Bluemercury or Ulta. Sephora, another main competitor to Bluemercury, doesn't have spa services but its exceptional rewards program keeps its customers coming back. In fact, sales from makeup shops where shoppers can choose among multiple labels at once have grown 20% since 2006, reported USA Today. Jefferies analysts Stephanie Wissink and Ashley Helgans seem to agree, writing in a note on Friday, July 28, that niche beauty retailers with access to indie brands, including Ulta and e.l.f. Beauty Inc. (ELF - Get Report) , are not at risk, but those carrying primarily legacy brands are. Nokes also stressed that in her email, "Bluemercury appears to be performing well (as evidenced by expansion plans) - benefiting from the overall industry position as above and also a compelling, more premium range typically not seen outside the department store environment. Given the struggles of the department stores, Bluemercury appears to be capturing share and driving traffic in a smaller, more focused format." The latter is good news for Macy's, which desperately needs the foot traffic. Meanwhile, struggling J.C. Penney (JCP - Get Report) is luring in people through thoughtfully placed Sephora shops in its stores. Broadening their horizons beyond neighborhood stores, Bluemercury recently opened their flagship in the midtown Manhattan Hilton where they will have access to a more international crowd rather than their usual on-the-go professional female customer. Inside the Hilton store is an example of what they believe will be more of the future of purchases. 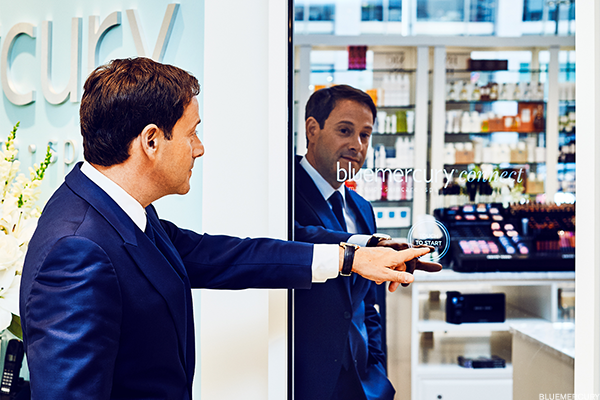 That includes the Beauty Connect mirror, which allows the customer to scan products for virtual application, product tutorial videos, and the ability to 'one click buy' via Apple (AAPL - Get Report) Pay, Google (GOOGL - Get Report) Wallet as well as remote purchase with a credit card, which will trigger one-hour delivery to any address within Manhattan. For example, you could be getting ready for an event and realize you need a specific shade of lipstick you don't have at hand. You can choose the one you tried at the Bluemercury in midtown NYC and a messenger will deliver said lipstick to your apartment within the hour. An elevated brand not attached to malls gives Macy's a slight edge to their portfolio, especially during what TheStreet's founder and Action Alerts PLUS portfolio manager Jim Cramer calls "the selfie generation", where people need to be camera ready at all times. Even when retail itself is looking dark, at least cosmetics are still pretty.